Aikido was developed in the last century and has now spread to many countries and, over time, many different associations have formed. This can offer a bewildering choice to a beginner. So how do you choose? It really comes down to the teaching and to the lineage of the teachers. Who are the main teachers and what is their place in the development of Aikido? Our teaching line is very simple and very direct. The roots of Aikido can be found in the Ju-Jitsu taught by Sokaku Takeda. His student, Morehei Ueshiba, added an ethical dimension to the practise whilst ensuring its martial integrity. Ueshiba appointed Koichi Tohei as his chief instructor. He was the main driver in the development and worldwide popularity of Aikido after the war. In 1977, Tohei Sensei sent Kenjiro Yoshigasaki, one of his most experienced direct students, to develop Aikido in Europe where he has been teaching ever since. 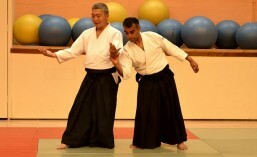 Our club instructors have been direct students of Yoshigasaki Sensei for over twenty years. With Yoshigasaki Sensei we have a very short and direct line between us and the early pioneers of the art. Yoshigasaki Sensei, who is fluent in English, has been able to communicate the various intricacies and subtleties of Aikido across Europe through classes and seminars that anyone can understand. Our clubs are part of the British Ki Society and members of the Ki No Kenkyukai International All of our clubs and instructors are recognised by the British Aikido Board.